You won’t believe how rich and delicious this healthy main dish tastes. Slice the tenderloin into 1/4-inch strips. Combine the salt and pepper with 1 cup of the gluten free flour in a bowl. Dredge the meat in the flour mixture to completely coat it. Heat skillet to medium-high, then add 3 T. vegan butter. Once slightly melted, add the floured meat mixture and brown quickly, about 2-3 minutes per side, depending on thickness. Once browned, transfer to a plate and keep warm. Add another 3 T. of vegan butter to skillet. Add mushrooms and shallots and sauté over medium heat until just softened, about 2 minutes. Remove mushrooms and shallots, and add these to the meat mixture. Add the remaining 1 T. of vegan butter to pan drippings (if needed, add another T. as well). Add in the remaining 3 T. of gluten-free flour and tomato paste and whisk together. Slowly whisk in the vegetable broth; cook and whisk over medium-high heat until thick and bubbly. Return meat and mushroom/shallot mixture to skillet, stirring to completely combine, 2-3 minutes. Stir in dairy-free sour cream. Cook slowly for 10 plus minutes until meat is cooked through. Do not let come to a boil! Serve over gluten-free noodles and enjoy! 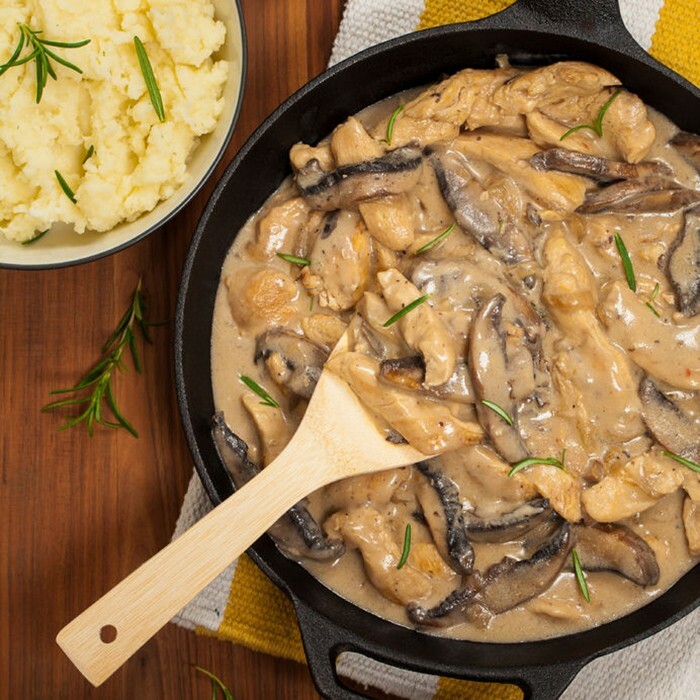 There are multiple options for this stroganoff - substitute chicken, beef or even tofu for the pork! Treat these other options just like the recipe reads above. Remember, you have lots of choices when it comes to the onion part, too - I use shallots in this version, though leeks, scallions (greens included), red onion or white are all delicious. You can also use a grapeseed, avocado or coconut oil in place of the vegan butter. And you can serve this over more than just gluten-free noodles - try it on quinoa, rice, buckwheat...all perfect options! I love to garnish it with chopped parsley and chives.